World Interfaith Harmony Week aims to promote harmony between all people regardless of their faith and non-faith. It provides a platform, one week in the year, where people of every group can recognize their common values, build ties with each other, and work alongside one another to bring peace and harmony to their communities. You can read 5 things to know about World Interfaith Harmony Week. Due to difficulties in being able to book our usual venue at UTAS Multifaith Centre, we will host this gathering at the Brahma Kumaris Meditation Centre, 51 Risdon Rd, New Town 7008 (Cnr Bell St) on Sunday 17 February 19 from 3.00-4.30pm. Cecilia has directed our attention to the 25th anniversary of an Expanded Global Ethic, developed by the Parliament of the World’s Religions. We also hold in our thoughts and prayers all living things affected by the catastrophic flooding in north Queensland. 5 February Chinese New Year (Buddhism) Year of the Pig, expresses qualities of gentleness, generosity, calmness and compassion. 11 March Great Lent (Orthodox Christianity) Orthodox observance of 40 days preparation for Resurrection. Dances for Universal Peace is now held every fortnight on the 1st and 3rd Tuesday of each month at 7.00pm. The first Tuesdays are, as always, led by Nicola. The third Tuesday by a combination of Chando, Kafia and Mieke. Please note the new time starts at 7.00pm. Camping/dancing event from 8-11 February 2019 (Regatta Long Weekend) on Bruny Island at 851 Killora Rd., North Bruny. Come and join us for a weekend of camping. Bring family, kids, friends – everyone welcome. Come for the whole weekend, or just for a day or two. There is also the option to sleep in the caravan and annex. 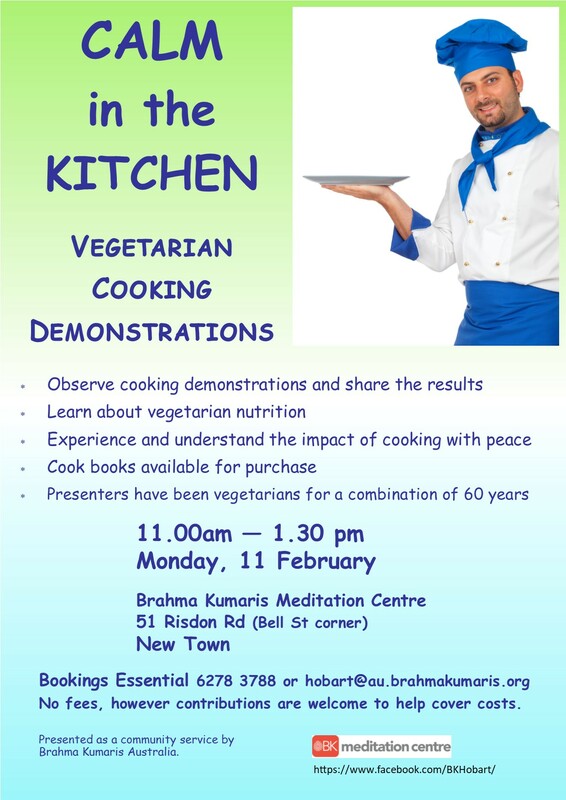 Calm in the Kitchen: a vegetarian cooking demonstration with a focus on the impact of cooking with a peaceful attitude. Monday 11 February 2019 (Regatta Day) from 11.00am-1.30pm (includes lunch). Location: Brahma Kumaris Meditation Centre, 51 Risdon Rd., New Town (Cnr Bell St). There are no fees, but contributions to help cover costs are welcome. 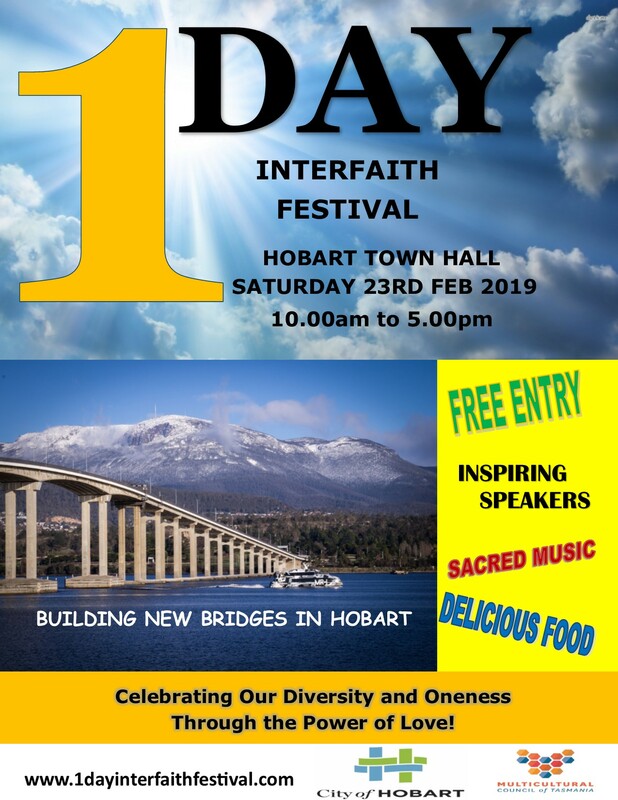 1 DAY INTERFAITH FESTIVAL will be held at the Hobart Town Hall on Saturday 23rd February from 10am until 5pm. Here is a rare opportunity for people of goodwill, professing a diversity of faith traditions and hailing from a variety of spiritual backgrounds, to come together to celebrate their differences as well as the common spiritual threads that weave their life experiences into one harmonious fabric. This festival will proclaim our ONENESS and will challenge us to open our hearts and minds to one another in a spirit of peace, love, and unity. Please join us on this ‘1derful’ day and invite as many other people as possible to do the same. The festival is free and family-friendly! *Discussion on spiritual understanding on Atma, Paramatma, Brahman, Karma etc. *To share personal view points on how to address unanswerable questions of life. *To encourage self study and to share of the information gained on the same. The next topic on the Satsang Group Discussions is the “VIVEKA-CHUDAMANI” or “The Crest-Jewel of Discrimination”, which will be presented by Dr. N Jeyasreedharan (Sree). The reference book for the presentation is “The Message of Vivekachudamani” by Swami Ranganathananda. Sree will lead the study which will include readings from the reference book, slide presentations, sound and video recordings and other interpretations. At the end of presentations there will be opportunity for discussions. The Viveka-Chudamani is one of the important original works of Adi Sankaracharya. The central theme of Vivekachudamani is God in its transcendental, impersonal aspect – beyond mind and duality. Adi Sankaracharya’s style of presenting such an abstruse subject as self-realization in this excellent text Vivekachudamani is both concise and incisive in its approach and analysis. It at once appeals to the mind and the heart. It is highly poetic and deeply mystic, and yet rational. The hidden message of the text is on direct intuitive experience which is far greater than any amount of scholarship, argument or discussion. Harmony Week is a state-wide program dedicated to showcasing our differences and acknowledging we all belong. Coordinated by the Multicultural Council of Tasmania, in partnership with the Tasmanian Government, Harmony Week builds on national Harmony Day, celebrated on 21 March to coincide with the United Nations International Day for the Elimination of Racial Discrimination. Bookings are now open for our April 2019 (18-26 April) retreat with Zasep Tulku Rinpoche at Dorje Ling Retreat Centre, Lorinna, Tasmania. For information and inquiries, www.tashicholing.net or ring Kkate on 0432 630 796. Meditation meetings will be in recess from 11 December and will resume on the first Tuesday evening in February. Spiritual Care Australia will hold its national conference at the Catholic Leadership Centre in Melbourne from 16-19 June 19. The title is Setting the GPS: finding your way in spiritual care. Anyone engaging in spiritual care is welcome to attend – whether you work in aged care, community care, congregational care, crisis / emergency, defence, education, general health care, mental health, prisons, sports, or any sector. There will be a Kailash and Mansarovar pilgrimage in July 2019.